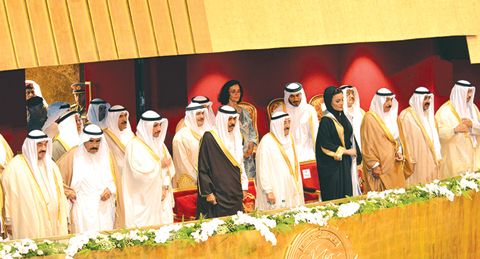 KUWAIT: (Top) HH the Amir Sheikh Sabah Al-Ahmad Al-Jaber Al-Sabah (fifth right), HH the Crown Prince Sheikh Nawaf Al-Ahmad Al-Jaber Al-Sabah (sixth right), Sheikha Moza of Qatar (fourth right), former National Assembly Speaker Marzouq Al-Ghanem (fourth left), HH Sheikh Nasser Al-Mohammad Al-Ahmad Al-Sabah (second left), HH the Prime Minister Sheikh Jaber Al-Mubarak Al-Hamad Al-Sabah (right) and other officials attend the opening ceremony of the Sheikh Jaber Al-Ahmad Cultural Center yesterday. KUWAIT: Under the auspices of HH the Amir Sheikh Sabah Al-Ahmad Al-Jaber Al-Sabah and with the Amir in attendance, the inauguration ceremony of the Sheikh Jaber Al-Ahmad Cultural Center was held yesterday, featuring a spectacular show that combined international and local music. The ceremony was attended by HH the Crown Prince Sheikh Nawaf Al-Ahmad Al-Jaber Al-Sabah, Qatar’s Sheikha Moza bint Nasser, former National Assembly Speaker Marzouq Al-Ghanem, senior sheikhs, HH Sheikh Nasser Al-Mohammad Al-Ahmad Al-Sabah, HH the Prime Minister Sheikh Jaber Al-Mubarak Al-Hamad Al-Sabah and other senior state officials. The ceremony kicked off with the national anthem followed by a speech by the Deputy Minister of Amiri Diwan Affairs Sheikh Ali Al-Jarrah Al-Sabah. “Today is a momentous day, as a cultural landmark, the Jaber Al-Ahmad Cultural Center has been opened,” Sheikh Ali said. He added that HH the Amir’s attendance augments the joy of the occasion, noting that the center will be instrumental to the development of the cultural sector in the country. Furthermore, Sheikh Ali said that the nation now enjoys the fruits of its labor, adding that he is confident that similar great achievements will follow. He then thanked the country’s leadership, wishing Kuwait continued prosperity. Italian tenor Andrea Bocelli then performed at the cultural center, which includes a 2,000-seat opera house, the first in the state. Top Kuwaiti singers, artistes and performers took part in the event, which was also attended by a large number of local and foreign dignitaries. The sprawling 214,000 sq m center is located in the heart of Kuwait City and comprises four buildings, a theatre center, a music center, a conference center and a library for historical documents.